Though only second in size to Negombo and much smaller, Gampaha is the capital of the district of the same name, which comprises the Western Province territories to the north of the Kelani River. Gampaha District was once a part of Colombo District, which had to be divided due to the overproportional population size. Still, the remaining Colombo District and the new Gampaha District are by far the two largest in Sri Lanka, with a population of about 2.3 million each. Gampaha town has only 10.000 inhabitants, but the urban area is much larger and also includes the neighbouring town of Yakkala at the Colombo-Kandy mainroad (A1). The key factor of urban development in this area was the establishment of the island’s main railway line in the 1860s. The town was finally completed according to a systematic scheme in the 1920. 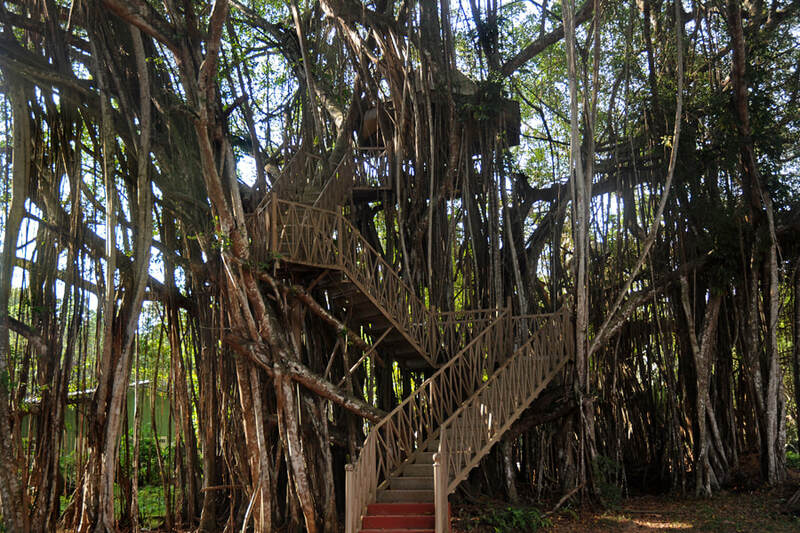 Gampaha’s main attraction is the Botanical Garden, which is also known as Henarathgoda Botanical Garden. It’s situated 2 km north of Gampaha Railway Station. The garden area covers 17 hectare. The garden, home to several palm tree species, also consists of a lawns, alleys and stretches of secondary forest as well as small flower gardens, a Japanese garden, an educational garden and a medicinal garden and several greenhouses, one orchid house in particular. Gampaha Botanical Garden is home of about 80 bird species including 10 endemic species. The playground is a popular weekend holiday destination of local families. Several trees grown experimentally for commercial purposes in the 19th century can still be seen in Gampaha Botanical Garden. Gampaha Botanical Garden was established by the British in 1876. It played a crucial role in their successful attempt to undermine the Brazilian rubber monopoly. Henry Alexander Wickham (1846 –1928) had stolen seeds from the the rubber-bearing tree, Hevea brasiliensis, in the Santarem area of Brazil in 1876. He brought those seeds to the world-famous Kew Botanic Gardens near London, where the trees could not be grown. Therefore, rubber seeds were send to Britain’s tropical oversea territories in Africa and Asia. Due to failures of their rubber trials in India, the British attempts to grow a rubber tree were focused on the wetlands of Ceylon, the climate of which resembled that of the Amazon bassin. The cultivation turned out well in Gampaha, which had received 2,000 of the 70,000 seeds Wickham had stolen. The roots of the first rubber tree grown outside Brazil, blooming in 1881 for the first time, can still be seen in situ in the Botanical Gardens. From Gampaha, new seeds were exported to Malaysia, which became the most important rubber cltivation area of the British Empire. In a way, the sparse remnants of the first rubber tree in Gampaha, now protected as a national monument, are a memorial of some historical and international significance, since the rubber tree grown in the Gampaha marked the end of the rubber boom of the Amazon valley. Rubber plantations in South and Southeast Asia turned out much more efficient than traditional rubber tapping in Brazil. The reason was that Asian rubber was grown in plantations, whereas in Brazil it had to be gathered from forest trees of much lower rubber tree density. Cultivating rubber in plantations turned out to be highly probemlatic in Brazil due to a tree leaf fungus and other diseases. Many of today’s commercial rubber trees are descended from the seeds that were stolen by Wickham, who is therefore rembered as a “bio-pirate” in Brazil. The best period to visit Gampaha Botanical Garden is in northern autumns months, which is the main blooming period is Sri Lanka’s tropical wetlands after the end of the southwest monsoon rain period.